Amanda has many years of experience in veterinary nursing. She commenced in the industry out of a want to improve animal’s lives while getting lots of cuddles. This kicked off with volunteering at the Animal Welfare League of Queensland (Coombabah) for 6 months before starting a Certificate IV in Veterinary Nursing. Amanda then spent 7 years working at the shelter and in General Practice before transitioning to Animal Emergency Service in 2009.Amanda is passionate about every aspect of Emergency and Critical Care Nursing with Intensive Care being a particular area of interest. 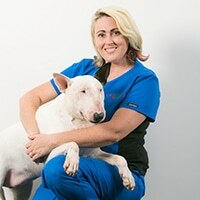 Beyond the balancing act of shiftwork, Amanda is also a member of the Veterinary Council of Australia (VNCA) in which she was previously Vice-president of the council. She is also a member of the Veterinary Emergency & Critical Care Society (VECCS) and the Academy of Veterinary Emergency and Critical Care Technicians (AVECCS). Having been accredited with a Diploma in Nursing Emergency & Critical Care, Amanda is currently studying to obtain specialty in Nursing Emergency & Critical Care which is an internationally recognized qualification. In her spare time, Amanda enjoys boxing, the theatre, going to concerts and spending time with her husband and fur-babies camping or traveling. Their pets include Lola an English Bull Terrier who loves sleeping and eating strange things; And Scout a miniature English Bull Terrier who has an unhealthy obsession with empty crab pots and whose favourite activity is hanging out with dad in the garage (aka man cave).